**CD ORDERS** Click HERE and choose "Buy Compact Disc" in the new window. *INTERNATIONAL CD ORDERS* click HERE and choose "Buy Compact Disc" in the new window, then choose your country in place of "United States." 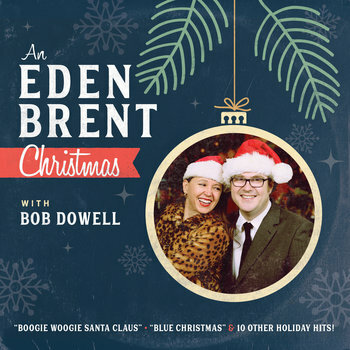 Soon after Mississippi blues pianist/singer Eden Brent met London trombonist/arranger Bob Dowell on the 2008 Blues Cruise, they began a relationship that included one particularly sweet tradition: they'd spend Christmases in Eden's hometown of Greenville, Mississippi. The yuletide season had always held a special place in both their hearts, and the feeling deepened with each holiday visit. When Eden began to feel the urge to make her first Christmas album, it was clear that Bob (now her husband, who'd moved to be with her in Greenville) should write the charts. A graduate of the Royal Academy of Music, Bob had been immersed in blues, jazz and R&B for years, and arrangements were his forte. Preparations began, with Bob sketching out charts for Eden's holiday favorites. "For Blue Christmas", they leaned more toward Fats than Elvis. For Santa Baby, a Count Basie-style bluesy swing was the thing. For "Santa Claus Is Comin' to Town", the spirits of Allen Toussaint and James Booker came to them, with a second-line groove giving way to a rhumba rhythm. "Boogie Woogie Santa Claus" was perfect for the potent piano powers of Eden. And for "Baby, It's Cold Outside", Eden left Bob no choice: he would sing for the first time on record, joining Eden in an effortlessly charming duet. For the sessions, Bob tapped the deep pool of Memphis instrumentalists with whom he's played and recorded. The musicians heard here have worked with B.B., Aretha, Booker T., Dr. John, the Bo-Keys and more. This project had been years in the making, but this became a "hit it and quit it" recording. One practice, one take: this is what largely went down, with a team of Memphis stalwarts, Bob's inspired charts and Eden's earthy vocals sounding more Etta than Ella. Whether you're feeling a Dickensian winter bite or basking in balmy climes, this is a warm-hearted Christmas throwback you'll spin every year about this time! Palate to Pallette "Magical Mississippi Tour"
Television hosts chef Robert St. John and watercolorist Wyatt Waters and their entourage invite you to a festive evening of culinary and aesthetic Mississippi magic. Real-deal Mississippi blues festival covered in the New York Times and other international media. It is like no other event in the world. Saturday's wristbands permit access to all venues and are $20 in advance or $25 at the gate. Come enjoy the South's best seafood on the bank of the Alabama River in this "Keeping the Blues Alive" Award-Winning venue! Eden joins piano greats: Bob Seeley (who is celebrating his 90th birthday), Liz Pennock & Dr. Blues, and Ricky Nye for a boogie woogie and blues extravaganza. Watch these old friends show off for you and each other! Eden joins Tommy Castro, Tinsley Ellis and Curtis Salgado. A Christmas Album release and museum fundraiser! Complimentary cocktail and hors d'oeuvres at 7pm followed by a conversation and holiday concert at 8pm in the Sanders Soundstage. FREE live radio show with CASH BAR features author readings and musical performances. This fall season finale features humorist HARRISON SCOTT KEY, Delta Magazine contributor and legendary storyteller HANK BURDINE, and the hootenanny YALOBUSHWACKERS. FREE! CASH BAR! Free community festival commemorating President Theodore Roosevelt's bear hunt. Arts, crafts, food, music and a fireworks finale. Three-day event celebrating local and regional artists, musicians, and tamale makers as well as some of the South’s most influential chefs and writers. American music festival on the bank of the Mississippi River. On-site RV and tent camping available. Other 2018 performers include Lucinda Williams, Cedric Burnside, James McMurtry, Kenny Brown, and Steve Azar. Eden won't junk up your inbox, and you can opt out at anytime.